On December 17, 2013, SPRING hosted a webinar focused on the Digital Green community-led video approach, and how nutrition can be integrated into this unique agricultural extension platform. Launched as a part of Microsoft Research India's Technology for Emerging Markets team in 2006, Digital Green has helped produce over 2,600 videos with more than 150,000 households across seven states in India, Ethiopia, Tanzania, and Ghana. The organization works in rural areas to produce videos by the community and for the community, in order to exchange context-specific agricultural and health practices. SPRING is partnering with Digital Green in Odisha, India to tailor the use of this video-based methodology specifically for nutrition content. 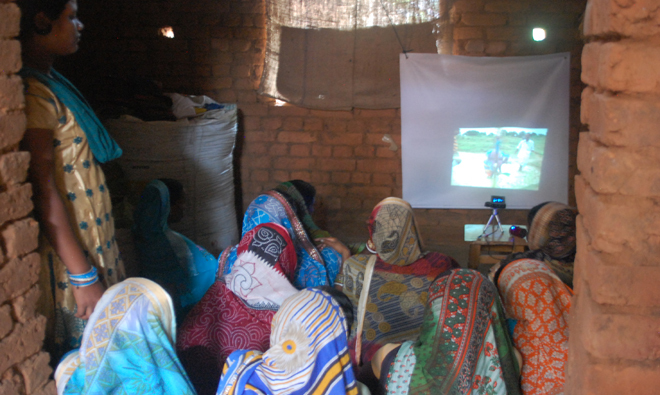 Videos are shared among small community and women's groups on a weekly basis using highly portable, battery-operated pico projectors. A robust suite of analytic tools coupled with feedback from community members, provide Digital Green and its partners with timely data to better target the production and distribution of videos. In the agriculture sector, Digital Green's approach has been found to improve the efficiency of existing development efforts by a factor of ten times, per dollar spent. Read Digital Green's responses (PDF, 727 KB) to all unanswered questions asked during the live webinar. Dig in to the two-day online discussion around Digital Green, hosted on our Agrilinks group page. We encourage you to sign-up for the group in order to be a part of future conversations.